It’s an experience … to walk into a local business and have every room, wall and decorative detail radiate a sense of community and Northwest pride. 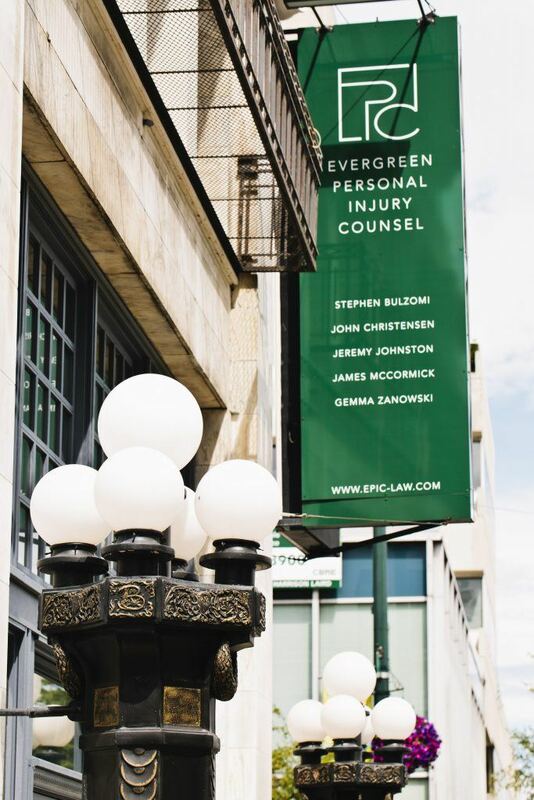 This year, existing business Evergreen Personal Injury Counsel (EPIC) stepped in as the newest tenant at the historic Bowes Building and consciously developed the interior to represent the history and charm built within and around the iconic downtown landmark. A collaboration of local industries ensued and the final product, a working exhibit of community partnership and Puget Sound heritage, is on display at the 9th Street address. 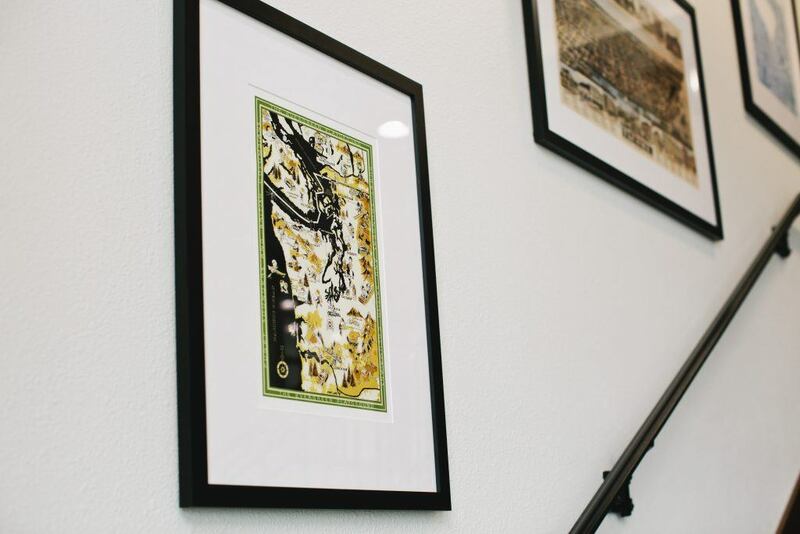 By showcasing local creatives and their Tacoma-inspired artwork, the EPIC team mastered a new trade of design and aesthetic that transcends a tangible, framed piece of art. It manifests a bigger movement sweeping the city as professionals unite for the greater good and a stunning work space. Windows pull the natural light from the north entrance and illuminate an interior outfitted in true Northwest style. Upon entering the double doors attention may be drawn to the large Fife Signs mounted on aluminum dibond at each side of the foyer. 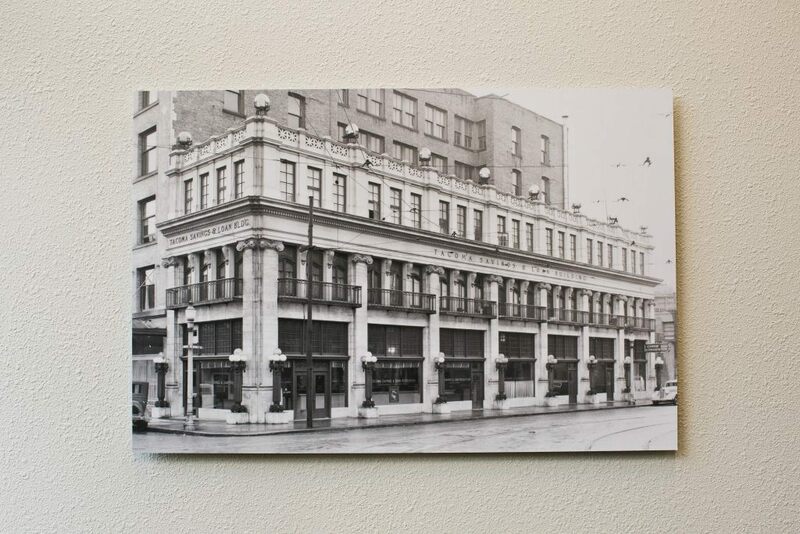 The task of framing and hanging the art here and throughout the building was entrusted to the specialists at Tacoma Frame Makers, located on 6th Avenue. EPIC was adamant about enlisting a neighborhood framer to align with the community inspired design. Both images depict the exterior of the building dating back to the turn of the 20th century. A stoic black and white image, borrowed from the Tacoma Public library archives, shows the building when it was Tacoma Savings & Loan. The antique, sepia tone version on the opposite wall reads Macleay Delape Co. Real Estate. In this frame, a single Model T claims a street-side parking space and denotes the age of the image, originally printed as a postcard. It’s these key pieces that set the tone and professional poise continued throughout the space. Perspectives shift through time with examples of environment in art, utilizing materials like metal, wood and leather. 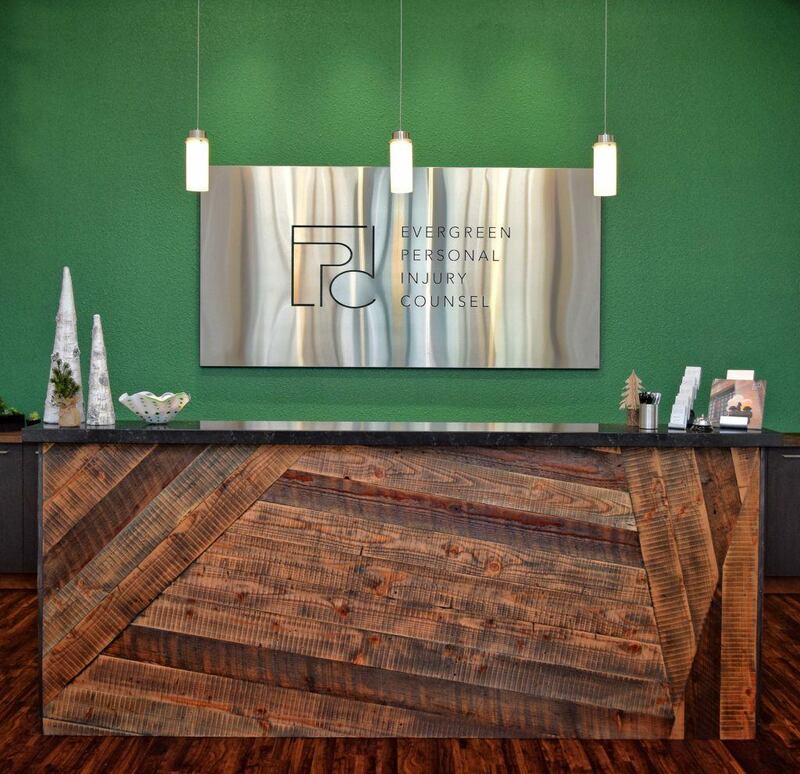 As you venture further into the building, the Pacific Northwest theme envelops and incorporates the token color and feel of that first evergreen painted wall complimented with recycled wood fixtures and dark leather furnishings. 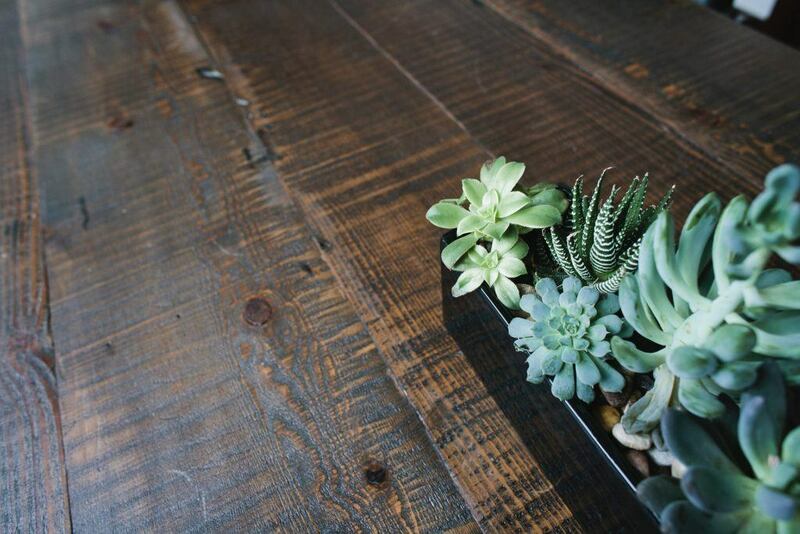 Long, heavy slabs of reclaimed wood provided by Urban Reclamation line the walls with tabletop and make up the stunning reception desk, staged with a collection of living succulents potted by Metropolitan Market in Proctor. 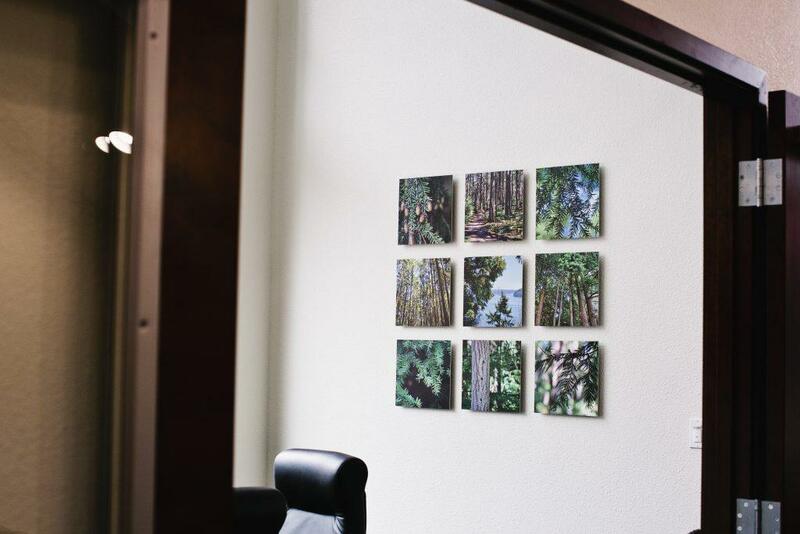 The designated “Evergreen Room,” reserved for conference meetings, features a 3-by-3 paneling of native northwest trees, leafy canopies and mossy forest floors. The law library traces the back wall of the first floor with a collection of legal material balanced with other aluminum dibond hangings of black and white aerial photography featuring old Tacoma. Other photographs within the space were captured by Nathan Jordan, EPIC’s Controller/IT Manager, and award-winning photographer Oona Copperhill, EPIC attorney James McCormick’s wife. Tacoma maps evolves with each step as you ascend to the second story. There, private offices are uniquely decorated to the likeness of the individual inside, like the portraits of furry friends framed on Gemma Zanowski’s walls and the smaller name tags on each door, also provided by Fife Signs. The maps throughout the building suggest a sense of belonging. You are here, among the topographical wood work from Bella Maps, family-owned and operated in the Puget Sound. 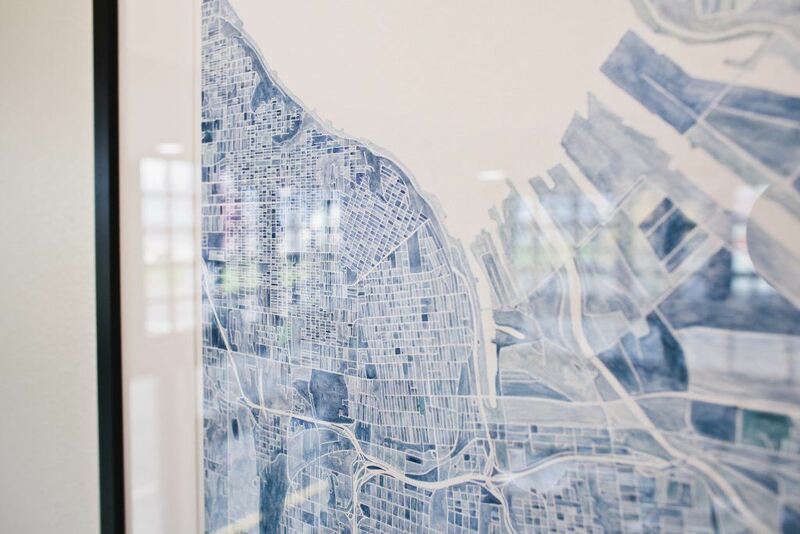 You are here, in the blue watercolor encompassing the eight square miles around EPIC’s Bowes Building address – a piece commissioned and creatively executed by local artist Kirsten Sparenborg of Turn of the Centuries. Entering a legal office for the first time as a potential customer or fellow business owner can, in some cases, feel an estranging and foreign experience – but not here. EPIC has used their local resources to tie in relevant, relatable themes and honor patrons past and present. So, pull on that new door to an old Bowes Building that you may have known in lifetimes before. 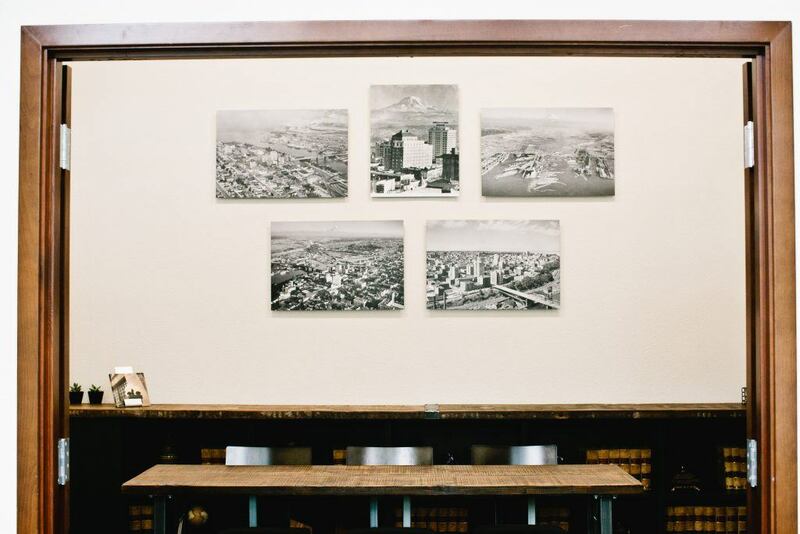 You’re sure to feel at home in this Tacoma-made atmosphere, a testament to fellow business and Tacoma creatives.